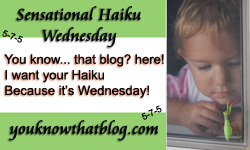 Sensational haiku Wednesday – Reality! This week’s theme is REALITY. That’s right folks. The Lost Season 5 premiere was last night and we had to watch the recap first, as Z dropped out a season and a half ago. So the dishes didn’t get done. See more haiku over at You know…that blog?